NATO parliamentarians pose for a photo at the start of the September 19 conference. 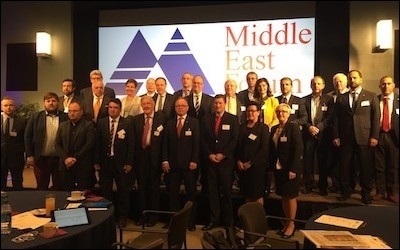 Philadelphia – September 26, 2017 – The Middle East Forum hosted a policy conference on September 19 for the NATO Parliamentary Assembly (NATO PA), focusing on Middle East-related issues. Steffen Sachs, NATO PA's Political Committee director, requested the Forum host the event, seeking our views "on the challenges NATO is facing from the Middle East." The conference results will be used for reports and policy recommendations to be submitted at NATO PA's annual meeting in Bucharest in October 2017. Twenty-six NATO PA members from twelve countries attended the day-long conference – many chairpersons of the Foreign Affairs or Defense Committees of their respective home legislatures. 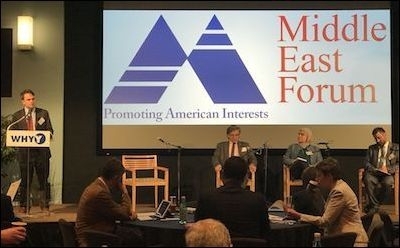 The Forum organized panel discussions on regional realities, Syria, and extremism in the West; followed by a public talk on the Middle East's importance to NATO. The presentations focused on practical policy solutions to complex issues. The Middle East is a sea of turmoil, with a Russian-Iranian unholy alliance working against American interests as Washington begins to re-engage in the region. In the Levant, Russian activities threaten NATO's southern flank, as Hezbollah – Iran's Lebanese arm – consolidates its grip on Lebanon and extends its reach into Syria. Iranian military infrastructure pushes the conflagration toward Israel's border. In Iraq, ISIS is almost finished as a military power, leaving Iran empowered in Sunni regions and in control of a land bridge all the way to the Mediterranean Sea. Meanwhile, the Kurds seek to secede, taking oil-rich Kirkuk with them. In the Gulf, the Trump administration is seeking to re-align U.S. policy to favor friends and punish enemies, reversing Obama's efforts. The split between Qatar and other Gulf Cooperation Council countries and Egypt presents a major challenge to NATO. In Israel and the Palestinian Authority, the "peace process" is irrelevant, as Hamas capitulates to Abbas in Gaza, Netanyahu faces criminal probes, and Palestinian society continues to see Israel's destruction as its primary goal. Ignore ISIS, which is largely irrelevant. Focus on countering/weakening the Iranian regime and its aspirations to Middle East hegemony, the top strategic threat. Support the Iranian people, who are natural allies of the West. Do not allow Qatar to play all sides. Do not force Israel to make yet more concessions, which make it look weak and invite aggression. Support the Kurds, the only allies of NATO other than Israel. Assad's position has been strengthened by Russian and Iranian support. His once-Alawite base of about 12 percent of the population has grown to roughly 30 percent due to moving peoples. De-escalation zones preserve Assad-Russian-Iranian gains and threaten Israel and Western interests. See Russia as the problem. Get Assad out by getting Russia out. Consider promoting the division of Syria into ethno-sectarian cantons. Do not allow Ankara to have veto power over NATO policies in Syria. Include the Kurdish People's Protection Units (YPG) in the diplomacy; do not permit the Republic of Turkey to choose Kurdish representatives. Sam Westrop, director of the Forum's Islamist Watch, moderates a panel discussion on extremism in the West. A battle between Islam and Islamism rages across the West, with the latter clearly winning. Mosques are full of hatred. Young people are prone to radicalization. Reformers and secularists are intimidated. Western institutions defend the extremists, granting them "victim" status; radicals do not feel pressure to reform. Focus on the Islamist ideology rather than its violent symptoms. Violent jihadists start as non-violent jihadists. Ideology is key. Support the secularization of Islam. Insist on the separation of mosque and state. Stop prison radicalization by taking care to exclude radical clerics. Middle East Forum president Daniel Pipes closed the conference with a plenary address, noting that NATO invoked Article 5 – calling for collective defense – for the first and only time the day after 9/11, to take on the Taliban in Afghanistan. Mr. Pipes then identified Turkey as the first member state to challenge the alliance, laying out a detailed indictment of the Islamist regime of Recep Tayyip Erdoğan, and arguing for Turkey's role in NATO to be diminished if not eliminated. The conference ended with the Turkish delegation storming out when a Turkish dissident was invited on-stage by Mr. Pipes to give voice to those opposed to Erdoğan's repressive regime.